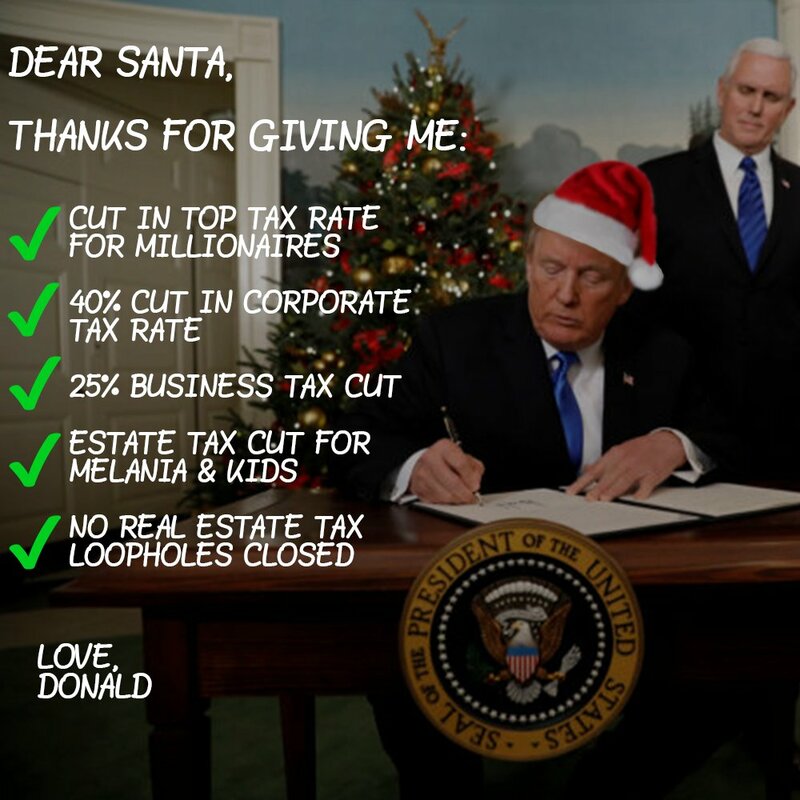 President Donald Trump has repeatedly described the Republican tax bill he signed into law on Friday as "an incredible Christmas gift" to low-income and middle class Americans—despite the numerous analyses showing that the legislation will ultimately raise taxes on millions in the middle class. The president hasn't, however, called the tax bill a massive "check to himself." But a new study (pdf) published on Friday by Americans for Tax Fairness (ATF) demonstrates that this would, in numerous ways, be a more accurate description of the $1.5 trillion plan. While it is impossible to determine precisely how much Trump will benefit from the GOP's legislation given that he has persistently refused to release his tax returns, ATF finds that Trump could save "at least $11 million a year and perhaps as much as $22 million," thanks to several central elements of the tax plan (as well as some of its under-discussed components). Most obviously, Trump will profit from the bill's reduction of the top individual tax rate from 39.6 percent to 37 percent. The massive cut to the corporate tax rate—which Trump has openly described as "probably the biggest factor" in the bill—will also be a huge boon for the president, given that he "owns millions of dollars in individual stocks and mutual funds." Other prominent aspects of the bill that will benefit Trump include the plan's favorable treatment of so-called pass-through business income as well as its estate tax exemption, which "doubles the amount excluded from the tax, from roughly $5.5 million for individuals and $11 million for couples to about $11 million and $22 million." ATF goes on to examine the bill's favorable treatment of the real estate industry, which "will continue to enjoy some of the biggest loopholes in the tax code under the Trump-GOP tax law." Where the GOP plan closes loopholes, ATF notes, it makes exceptions for the real estate business—where Trump made much of his fortune. "Like-Kind Exchanges (Section 1031 Exchanges): Capital gains taxes are usually due when an asset is sold for more than it cost. But under current law, investors in tangible items can indefinitely delay paying if they keep reinvesting the proceeds in another item—what’s called a 'like-kind exchange.' If these gains are continuously rolled over until the taxpayer dies, they are never taxed at all. The Trump-GOP tax plan closes the like-kind-exchange loophole for real property—except for real estate investors such as Trump, who get to keep this handy way of avoiding taxes on their gains. Limiting Interest Deductions. The Trump-GOP plan required almost all businesses to accept new limitations on their right to deduct interest payments on their loans. All businesses, that is, except for those involved in real estate investments, such as Donald Trump’s. He’s called himself the 'king of debt'—some observers estimate his business loans exceed $1 billion." The at-risk rule, which allows investors like Trump "to reap tax-saving losses from properties they bought mostly with borrowed money." Taken together, these loopholes and tax cuts could net the president millions of dollars of extra income per year—all while many middle class families see their taxes rise and their health insurance vanish.